Why should you wear sunglasses whilst riding? Grey lens - Good for dimming bright sunshine but with minimal contrast. Colour neutral. 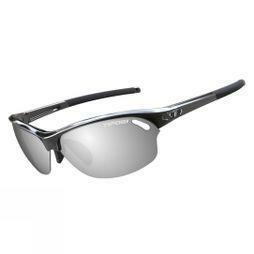 Alternatively you can choose a Photochromic lens which will automatically lighten or darken according to the amount of daylight available, giving you the best view of the road or trail ahead. These are great if you don’t want the hassle of changing lenses or if the weather is a bit unpredictable. These are also particularly well suited to mountain bikers who ride in and out of dark forested areas and bright open spaces. However, the range of light conditions that Photochromic lenses can adapt to won’t be as vast as different light specific lenses. It’s also worth looking out for a Hydrophobic coating which will repel water when it rains and an anti-scratch coating for extra protection, especially if you are riding off-road. Polarized lenses help to reduce glare and provide better UV protection so are another good upgrade to consider. The key to a good lens shape is a good amount of coverage over your eyes to shade them from the sun and to keep dirt, dust, wind and insects at bay. Glasses that have a one piece wraparound lens offer the best protection and good field of view. It’s vital to make sure the frame of the sunglasses fits you well. Frame styles will vary greatly so try a few pairs on to find the right fit for your head. The arm tips should sit just above the ears and the nosepiece should feel comfortable. Check that the frame is secure by looking down and shaking your head to make sure they won’t fall off whilst you’re riding. Most importantly, the frame should not impair your view in any way. Goggles are essential eye protection for downhill mountain bikers. With lots of mud and dirt flicking up into your face at high speed, a good pair of goggles will not only help you to see the trail ahead more clearly, but they could protect you from serious injury too. Mountain bike goggles come in all shapes and sizes so it’s wise to try a few different pairs on for size, fit and to check that you have a good wide field of view. Just like with sunglasses, the colour of the lenses will determine how well they work in different lights and anti-scratch and anti-fog qualities are a must. When the nights start to draw in it’s time to think about your lighting options. Here is a run through of the best lights for you style of cycling. Whether you’re riding on the road, track or trails, head protection and rider safety is paramount. The main purpose of a bike helmet is to protect your head in the event of a collision or crash so it’s wise to invest in the best protection possible. Bike helmets (also known as bike ‘lids’) need to fit comfortably and securely while providing adequate ventilation, so you can enjoy your ride without noticing the helmet is even there. Although using a helmet is not a legal requirement in the UK, most riders do and nearly all cycling events require you to wear one to participate.